If you’re looking to get that perfect latte at home just like the barista makes, there is one essential coffee gadget that you need to reach this level of perfection. A milk frother. At coffee shops, the espresso machines have a little component on the side that lets them froth the milk in a stainless steel carafe. You don’t have to go that far, unless you also have a home espresso machine with that function. Instead, you can purchase a standalone frother for your coffee and it will taste just as good as that expensive latte. There are a lot of frothers on the market right now, but we’ve compared the top milk frothers to come up with our list of the best milk frothers for the money when it comes to barista quality coffee drinks at home. If you’re trying to decide between the two types of frothers you see listed above, then let me help you out by showing you the differences between the two. The handheld frothers are usually battery powered, which means that you can take them anywhere – even camping. And the electric frothers either have an electric base that plugs into a wall outlet or the entire carafe plugs into outlet. You can’t heat milk with a handheld frothing unit – it only froths the milk. With an electrical unit, you can both heat and froth the milk. Based on my experience, I find that handheld units are the cheapest type of milk frothers on the market. You can usually find them for $20 or less. Electric milk frothing units have a higher cost and are usually prices between $30 and $50 for a good electric milk frother. Out of all the electric milk frothers that we compared, the Estilo 0153 Automatic Electric Milk Frother, Heater and Cappuccino Maker came out on top with our in-house reviewers as the highest rated of all the models on the market right now. The exterior of this model is polished stainless steel, so it looks awesome sitting on your kitchen counter. When guests come over, it will definitely look like a luxury coffee item. And the best part is that the Estilo 0153 milk frother is very affordable! In fact, like most electric frothers, it has a very affordable price (in my opinion). Click here for the Amazon price online. Cleaning this little machine is pretty easy. The inside has a non-stick coating that make it simple. Of course, you can’t really put it in the dishwasher since the carafe sits on the electrically charged hot plate, but a quick rinse in the sink is easy enough even for the busiest professional. This thing is FAST! Once you pour in the cold milk, it can be heated up to hot milk in only 80 seconds! And the carafe has vacuum insulation, which means that your hot milk will actually stay hot. This is important for people who plan on having a second cup of coffee or who are making several cups of coffee for friends and family – that way no one ends up with lukewarm milk. Once the milk is heated, you can easily lift the carafe off the non-slip silicone base and take it over to the table or wherever you need it. That also makes it easy to pour the milk into your coffee cups since you don’t have to worry about a heavy base weighing down the frother. 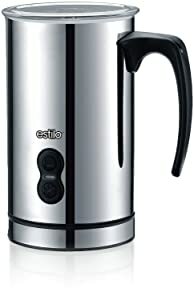 The frothing capacity for the Estilo 0153 electric milk frother is 115 ml, but if you just need to heat up some milk for lattes without foam, then the capacity is 240 ml. A heating whisk is attached to the lid for when you need it. Of course, a lot of times you’ll probably just need heated milk, which is perfect for both coffee and tea – as well as hot chocolate! This awesome little stainless steel milk frother can be used to froth both hot and cold milk for you hot and iced drinks like cappuccino. Or, like I mentioned, just heat up some milk for hot chocolate, coffee and tea. I even use my milk frother to heat up milk for oatmeal or porridge on cold winter mornings. 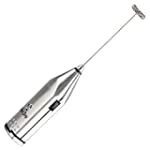 As of right now, this is our choice for top rated electric milk frother for the money, so if you want one of these gadgets that is highly rated by current owners, then it doesn’t get any better than this. However, if your budget is tight and you need something a little cheaper, there are a few other options on this page that might be a better fit for you. If you’re shopping for the top rated handheld milk frother on the market, then look no further than the Elementi Premier Milk Frother with Stand. This model really stands out from the pack because it is very highly rated by consumers, comes with a stand and has a very powerful motor. This Elementi frother has 15,000 RPM motor that can get you that foamed milk that you like in about 45 seconds. It is not the most powerful handheld unit, but close to it. Two AA batteries are required to power the device. This sleek milk frother makes a good gift for coffee lovers because it has a nice elegant design and the stand really makes it stand out from the other models. The handle has an ergonomic grip, which makes it comfortable to use even for older people who have arthritis. The stainless steel whisk is rust-proof, which means that when it’s displayed on your kitchen counter in the stand, it will continue to look like an awesome luxury coffee accessory. Plus, that stand makes it easy to store it right next to the espresso machine or coffee maker. Click here for Amazon price online. Clean up is very easy with this frother. All you have to do is rinse it off in some hot water and then put it back in the stand to air dry. Doesn’t get any better than that, huh? This frothing unit will get you that awesome velvety foam that you love on your coffee drinks. Use it for lattes, macchiatos, cappuccinos, whipped hot chocolate, and Bulletproof Coffee. And since it runs on batteries, you can use it anywhere – home, work, camping, etc. That’s what makes this such a great purchase. Whether you need a quiet milk frother or just want to be able to do it by hand, the best model for the job is the Bodum Latteo Milk Frother. The Bodum brand is known for making some of the highest quality coffee accessories and this manual milk frother is no different. 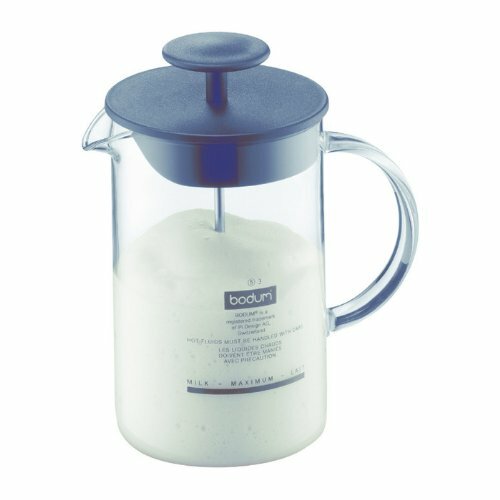 One of the best things about this Bodum milk frothing carafe is that is it made of glass, which makes it BPA free unlike many of the plastic carafe models. Of course, since this is a manual frother, it means that it cannot heat milk and can only froth it. However, since the carafe is made out of borosilicate glass, you can put it in the microwave for 30 to 50 seconds to heat the milk before you do the frothing! Just be careful getting it out since the handle is also glass. The glass handle is very easy to hold while you’re doing the frothing. And the entire process is just as quick as the handheld and electric models. To use the Bodum 1446-01US4 Latteo Milk Frother, just add milk up to the fill line and put the lid on it. Make sure you turn the lid so that the pouring outlet is blocked. Then, pump the plunger somewhere between 60 and 90 times. As you do it, you will start to feel the milk thicken. Once you’re done with this, let the milk sit about about a minute so that it can thicken some more on its own. After that, you’re ready to spoon out that milk foam onto your coffee! As you can see, the process is very easy and you get complete control over the thickness of your milk foam – pump longer for thicker foam or less for thinner foam. The total milk capacity is 8 oz, which is plenty for several cups of coffee. Just be sure to not make any more than you need since there is no way to keep it warm. Unlike all of the other models listed here, the Bodum 1446-01US4 Latteo Milk Frother is dishwasher safe. You can put all of its pieces in the dishwasher, or hand wash them if you prefer.